2.2 b) Docear’s “Literature Suite” concept: Drafting papers, theses, ..
b) A unique approach for drafting and writing your assignments, papers, books, thesis, etc. Docear is different than any other literature or reference manager (‘different’ as in ‘better’). It offers a single-section user-interface with all the information in a single place (see screenshot below). This approach offers three massive advantages. First, you can see annotations (comments, bookmarks, highlighted text) of different documents at the same time. Second, you can move annotations to exactly the category they belong to even if the corresponding document remains in a different category. Third, you can create categories within a PDF and sort annotations within that PDF. Most references managers have a three-component user-interface. The main component is a table showing all your documents (below screenshot, middle). In the second component you create categories to which you add your documents (below screenshot, left). In the third section, notes are displayed that you made in the documents (screenshot, right). There are three problems with this approach. First, imagine you have read in one of your documents that Google Scholar indexes invisible text, and you want to look-up this information, to read about it in more detail. First of all, you would have to remember that this information relates to your category “(Academic) Search Engine Spam”. Then, you would have to remember in which document you read the information. And then, you would have to find the particular annotation in the list of annotations. Now, imagine you have 200 documents listed in a dozen of categories and each document had about 20 annotations. If you were able to remember the category, the document, and where in the list of annotations the annotation is you are looking for, you would a) be a genius and b) wouldn’t need a software to organize your literature. If you are no genius, it’s more likely that you might remember the category, but not the document any more. So, what would you do? You would have to select each document in the category and scroll through all the annotations. That is not optimal because it requires a lot of time. Now, look back at the Docear screenshot. 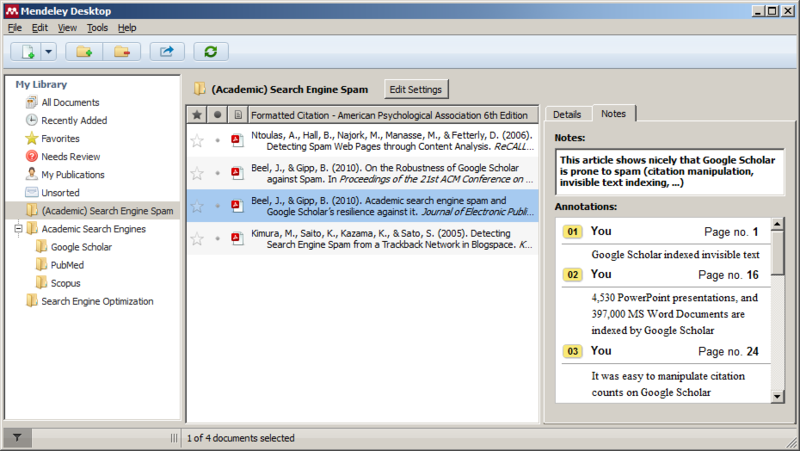 In Docear, you can display annotations of multiple PDFs in multiple categories at the same time. This allows you to find the information you are looking for much faster. Second, and more importantly, imagine you remember that you have read in one of your documents that “4,530 PowerPoint presentations, and 397,000 MS Word documents are indexed by Google Scholar”, and you want to look up this information. Where would you look for the information, given that you are not a genius but just a normal student or researcher? Probably in the category “Academic Search Engines -> Google Scholar”. However, the information is in a document about spamming Google Scholar and hence part of the “(Academic) Search Engine Spam” category. You probably would never find this annotation, except you skim through all your documents in all your categories. Actually, this scenario is very realistic. If you read a good academic paper it most likely contains interesting information about lots of different areas. Therefore, adding only entire documents to categories will not do good. When you have read twenty, or thirty papers you definitely will want to add single annotations to different categories, guaranteed! None of the reference managers we know can do this – except Docear. Look back at the screenshot. With Docear you can move single annotations (be it bookmarks in your PDFs, highlighted text, or comments) to whatever category you want. Finally, if you have a few dozens of annotation within a PDF, it is difficult to keep an overview (see below screenshot, left). Fortunately, Docear allows you to create sub-categories within PDF files (screenshot, right). This means, if you have e.g. 100 annotations within a single PDF you may create additional categories such as “Methodology” or “Evaluation/Results” and sort your annotations into these categories. This way, for instance, when you want to look how good the “PMRA” (PubMed Related Article) approach was, you just browse to the “Results” category in that PDF. If you want to know how PMRA was evaluated, you browse to the “Methodology” category. In summary, what distinguishes Docear from all others is that in Docear you have a) a single-section user interface that gives you a great overview of multiple PDFs and annotations in multiple categories at the same time b) you may sort single annotations independently from their parent PDFs which gives you far more freedom in organizing your information and c) you can sort annotations within a PDF into categories which allows you a far more detailed structure and overview. b) Docear’s “Literature Suite” concept: Drafting papers, theses, ..
Docear is much more than just a reference or literature manager. It supports you in discovering, organizing, and writing academic literature by bundling several applications into a single tool. This is the reason why we call Docear an ‘academic literature suite’. What makes Docear really unique is its integration of mind maps. Mind Maps are the key to the unique approach for organizing references and PDFs (see previous chapter) but they also provide you with one more benefit, namely Docear’s capability to support you in drafting your own academic literature (assignments, research papers, books, theses, …). 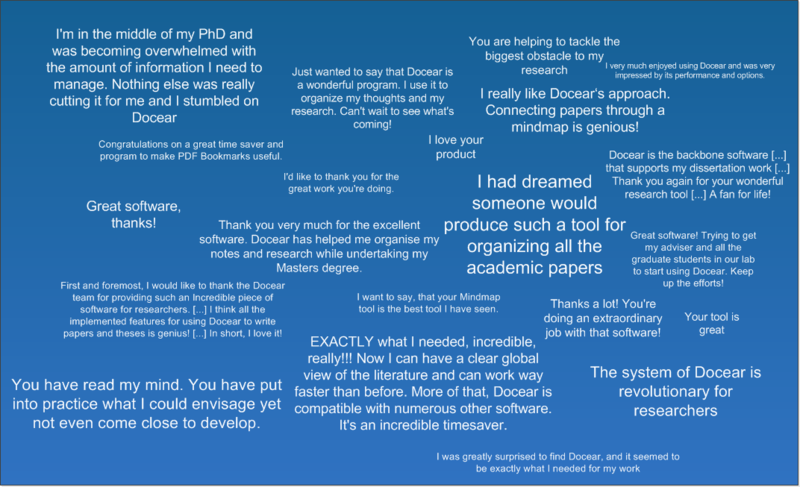 With Docear you can create new mind maps at any time to draft your own academic literature. The root node typically represents the title of your work. Nodes in the first level represent chapter headings, then follow sub-headings, paragraphs and finally you may create a node for each sentence. The great thing is, you can copy content from the previously created mind map in which you manage your literature to your draft. Look at the picture below. 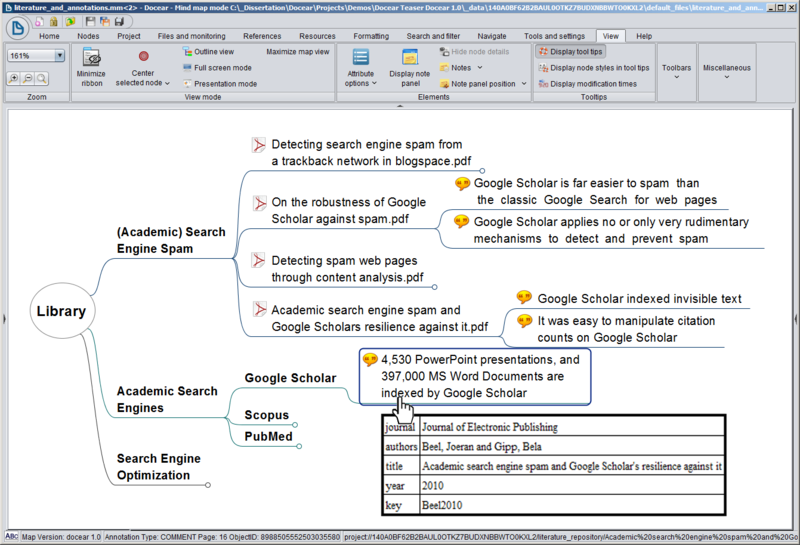 It contains a simplified draft of a paper, including PDFs and annotations copied from the “normal” mind map in which papers and annotations are managed (see screenshot above). In addition, you have all the features you would expect from a mind mapping software and that comes in handy when drafting documents. You may insert pictures, add formulas (LaTeX), format nodes (with HTML if you like), create additional notes, and so on and so forth. After finishing your draft, Docear supports you in writing your final piece of work. With our add-on for Microsoft Word (Docear4Word) you can access all your bibliographic data in Microsoft Word. You just select which entries to cite and Docear4Word will do the rest automatically, i.e. it will insert citations and bibliographies in the format your want. 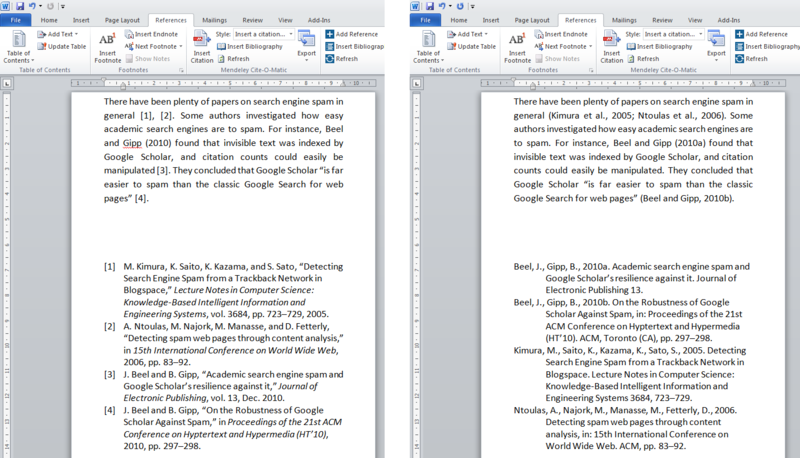 Actually, you can pick from more than 1,700 citation styles (APA, Harvard, ACM, IEEE, …). One of the most laboriously tasks for researchers is staying up to date with their research field. Docear helps you with this task. When you activate recommendations, Docear transfers your mind maps to Docear’s server (this is entirely optional). 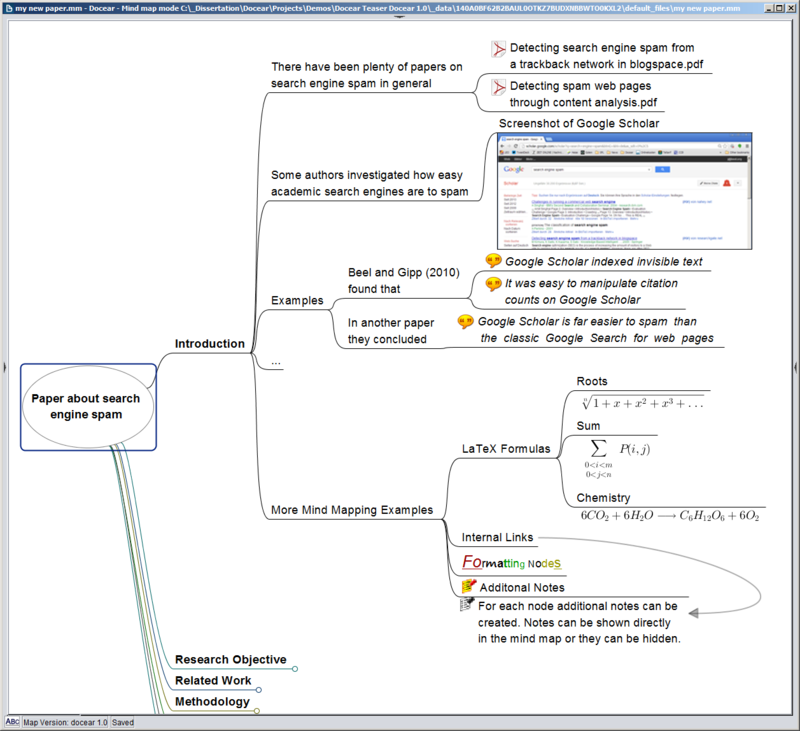 On the server, Docear analyzes your mind maps and identifies your research interests. Based on the identified interests, Docear suggest you academic articles from Docear’s Digital Library which contains around 2 million academic articles in full-text, from all kind of academic disciplines. We are not using any out-of-the-box recommender system but a truly unique system that we developed over the past years, and that we are continuously improving. 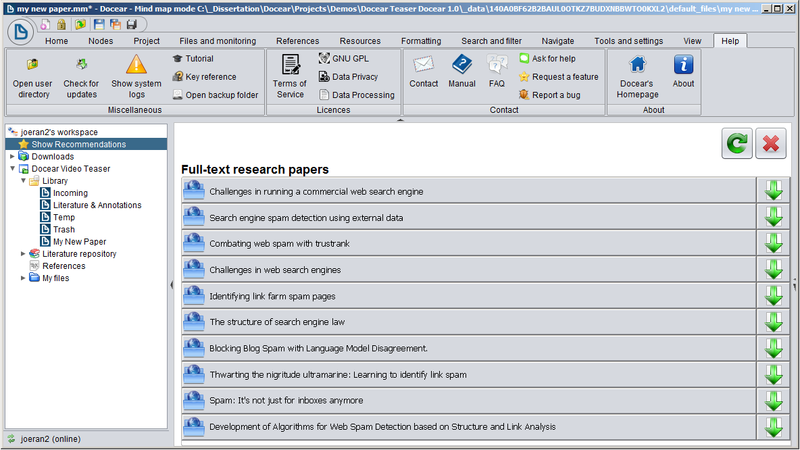 Since you do not only manage your references in Docear but your entire literature including annotations, and since you also draft your own papers in Docear, Docear can give far more personalized recommendations than any other tool. Just try it out and let us know what you think (the recommender system is under constant development and we are very keen to hear your ideas about it).